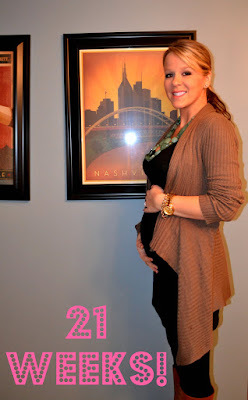 A Lovely Little Life: 21 Week Bumpdate! Baby Girl is definitely showing now!! How Far Along? 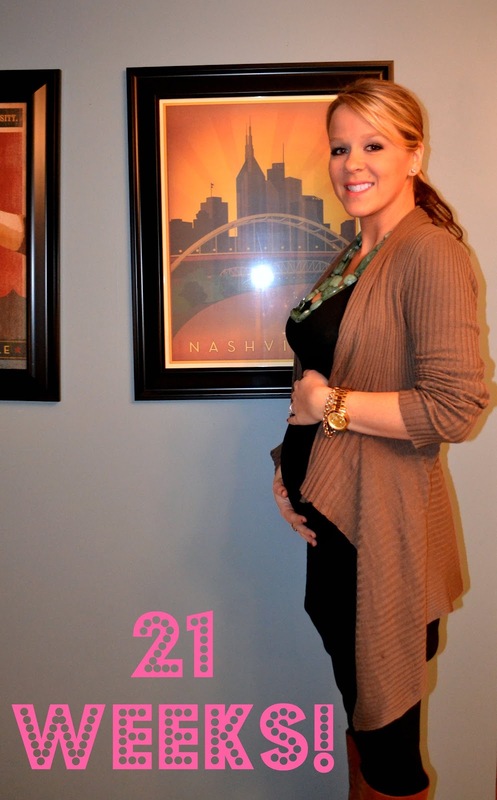 21 weeks, 5 days – only 128 days to go! Maternity Clothes? I ordered several pieces from Gap last week and almost all of them are fabulous! :) This bump is definitely needing maternity clothes now! Stretch Marks? Nope, but lathering up with that Burt’s Bees Mama Belly Butter! Gender? Baby Girl!! Elise Kelly Bellar! Sleep? not so good.... I wake up to go to the bathroom around 4 every night and have the hardest time getting back to sleep, no fun! Movement? Oh yes, this baby girl is moving and I love it! She either really like the music at church on Sunday or really hated it because she was dancing around! Food Cravings? fruit and caesar salad...odd.. Anything making you queasy or sick? nope! yay for this! Labor signs? this will be crazy when I answer anything other than no! Belly button in or out? still in...and hopefully will be for a long time!! Symptoms? Still back pain. Boo! And a fast growing belly! Happy or Moody? exuberantly happy!! Best Moment of the Week? Feeling her dance around!! and getting the registry all done! Looking forward to..getting everything for the nursery!! OMG! Cuuuute little bump. Over half way....can you believe it?! Looks like my bump! We both show late! That's so awesome you are craving salad and fruit! Lucky. And weird on the coffee, because I was obsessed and then getting preg I don't wanna touch it. The smell makes me ill. Oh and the back pain, I hear you. Her name is perfect and precious!!! My Blog got a facelift!